Julie Bayl shares a true story of married couple, Ben and Em, and the struggles they faced living under Nazi occupation during World War II. 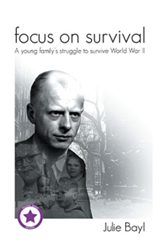 According to Bayl, “Focus on Survival: A young family’s struggle to survive World War II” (published by Xlibris AU) not only focuses on just one problem of war but covers many areas of civilian life and how that affects ordinary people’s lives. Based on a true story of survival and intrigue commencing before World War II, “Focus on Survival” leads readers into the fast-moving changes brought by the Nazi occupation in Holland. Ben, a successful third-generation photographer prepares to stand against the establishment. Together with Em, his wife, they show incredible courage and artful deception, playing “cat and mouse” with the Nazis, assisting the underground with forged passports, utilizing the black market, struggling to provide sustenance for their growing family, and against great odds, succeeding as winners. “I want readers to take away from my writing the lesson that determination and logical forethought can help us triumph during the trying times. It is about the need for them to think outside of the box. It is a heartwarming story about ordinary people doing extraordinary things,” Bayl expresses. Bayl invites readers to relive the experiences and be inspired by one family’s struggle and survival, and witness how their fighting spirit and perseverance paid off in the end. Julie Bayl was born in 1950 and grew up in Sydney. Upon leaving school, she was torn between a career in architecture or social work, being offered a 4-year scholarship for a cadetship with a renowned Sydney architectural firm or another option involving her love for people. She chose community based social work. In 1971, she married Charles Bayl, whose family had emigrated from Holland to Australia in 1953 seeking a better life. They moved to Cowra in 1974 and later had three children, Anita, Paul and David. They now have two delightful grandsons, Lennon and Banjo. Bayl has always taken a great interest in history generally, but especially family history. She is presently writing her own family history.